Click on Rasmea-Flyeract to download the complete flyer, with support activities. 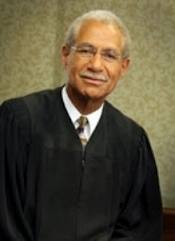 While we are pleased that Judge Drain rejected the “Anonymous Jury” motion from the prosecution, we are still very concerned about the ruling to allow partial sequestration. The decision to have the jury meet at a secret location, and drive to the courthouse in a sealed van, creates a militarized and security state atmosphere that will cause apprehension amongst the jury members, and prompt them to believe that Rasmea is somehow dangerous. She is innocent, and this ruling does not guarantee her a fair trial. 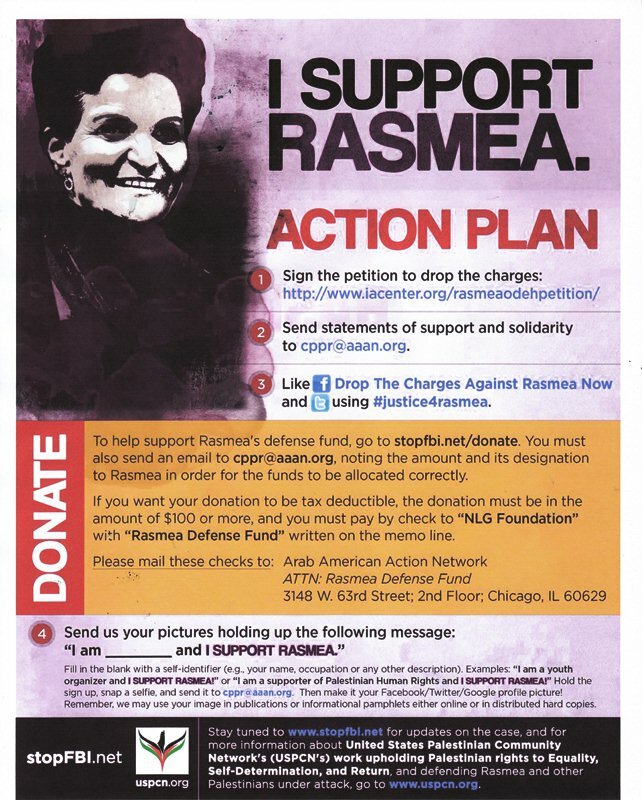 Rasmea has done nothing wrong and the trumped up immigration charges against her should be dropped. She is an iconic leader in the Palestinian community of Chicagoland, the U.S., and the world. Forty-five years ago, she was jailed and tortured by the Israeli authorities. That she is facing jail again, this time at the hands of Detroit’s U.S. Attorney, Barbara McQuade, is nothing short of shameful. 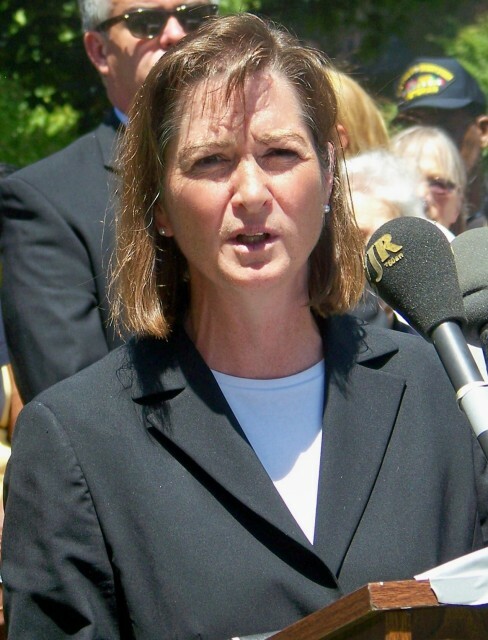 U.S. Attorney Barbara McQuade at Detroit police press conference June 30, 2013. The FBI, under the Justice Dept., had just assassinated Black Muslim leader Imam Luqman Abdullah in Dearborn in 2009. The prosecution’s talk about “jury tampering” is an attempt at intimidation and an act of desperation. McQuade’s office is trying to criminalize activities protected by the first amendment, like protesting outside the courthouse and calling the Department of Justice to demand the charges against Rasmea be dropped. We urge all supporters of civil liberties and Rasmea Odeh to join us in Detroit for her next hearing October 21 at 11 a.m. before Judge Drain in the U.S. District Court at 231 W. Lafayette, Room 110. 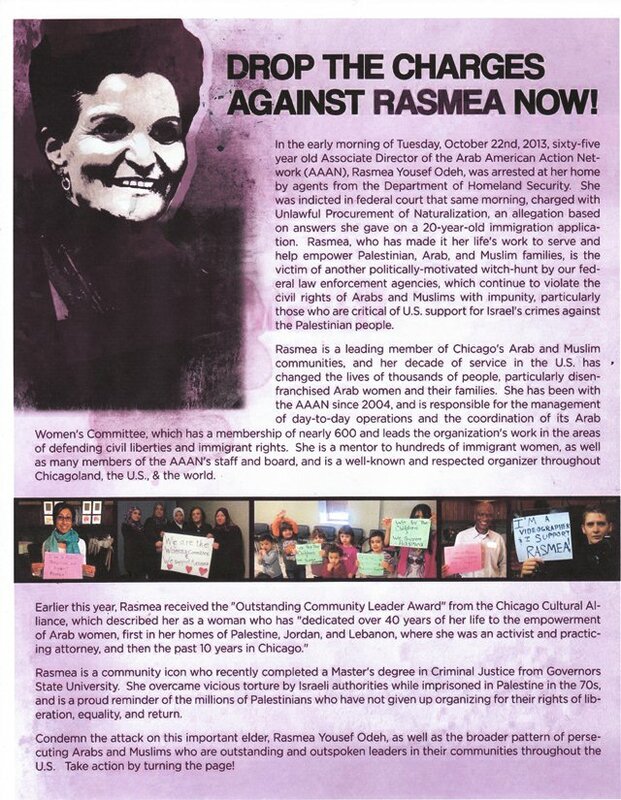 Rasmea’s trial starts November 4. Let’s pack the courtroom!